Trans Iskandar Route BET2 is a Johor Bahru local bus service operated by Sri Maju, plying between JB Sentral and Ulu Tiram via Tebrau Highway, Pandan City, Tebrau City and Desa Cemerlang. Its routing is identical to 188, 205, 717 and S&S 1. ^ Maju Higer KLQ6128G on Service 227, carrying BET2 plates. The route fully duplicates BET2. Trans Iskandar Route BET2 connects Johor Bahru City Centre (JB Sentral) with the town of Ulu Tiram, via Tebrau Highway, Jalan Pandan and Jalan Kota Tinggi. From JB Sentral Bus Terminal, the route serves many residential areas along Tebrau Highway, such as Taman Abad, Taman Tebrau Jaya, Taman Melodies, Taman Sentosa, Kampung Melayu Majidee and Kampung Bendahara, heading north to Pandan City, Tebrau City and Desa Cemerlang before terminating at Ulu Tiram Bus Terminal. 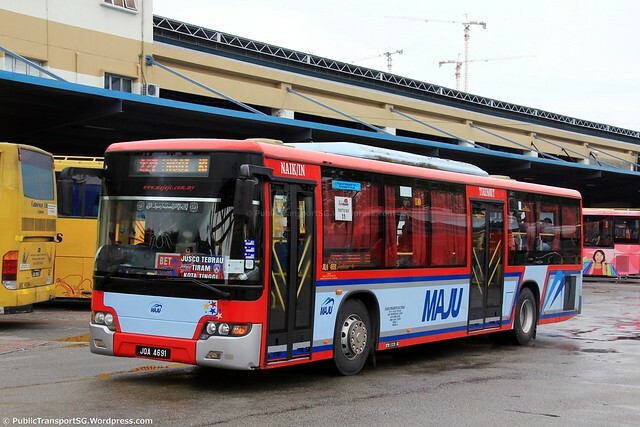 The route is identical to Maju 205 which Maju also operates, and buses can occasionally be seen carrying two sets of route destination plates. City Bus 188, JB Central Line 717 and S&S 1 ply exactly the same routing. In addition, Causeway Link 6B and Maju 227 also duplicate these routes entirely, terminating further north at Kota Tinggi. BET2 commonly utilizes Hino AK and Higer KLQ6128G buses.